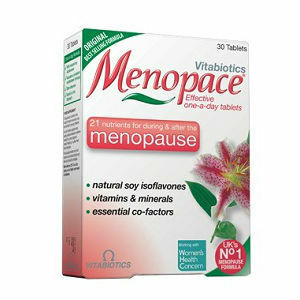 Menopace from Vitabiotics is a range of products designed to address women’s problems related to menopause. According to the manufacturer, these vitamins can be taken in the same time with hormone replacement therapy, and they can offer support for getting better results, as well. The aim of these supplements is to provide the female body with the needed nutrients so it can go through these times of change without having to suffer from unpleasantsymptoms. Let’s take a closer look to these supplements. What Do Menopace Vitabiotics Contain? Every product contains other ingredients, as well, but these are the most important. The use of phytonutrients is highly recommended for products aimed specifically at women, and Menopace Vitamins for Menopause Vitabiotics seem to use them. Still, we believe that a single product combining the powers of various herbal extracts can be more efficient and more convenient to take. Each product has a label on which the recommended dosage is written. The manufacturer recommends avoiding to take more than what it suggested on the label. The pricing for these supplements is in the same range with similar products. We could not identify a clear money back guarantee on this manufacturer’s website. You may have to contact them directly if you are experiencing any issues with your order or with the products purchased. Menopace Vitamins for Menopause Vitabiotics are made by a company named the “UK’s No 1 Vitamin Company”. The manufacturer seems to enjoy a good reputation, which is a great thing when you intend to purchase natural supplements. Important phytonutrients are used in making these menopause supplements, but you may have to take more than just one product, in order to address all the problems experienced through the onset of menopause. Jackie Horowitz	reviewed Menopace Vitabiotics	on January 31st	 and gave it a rating of 2.